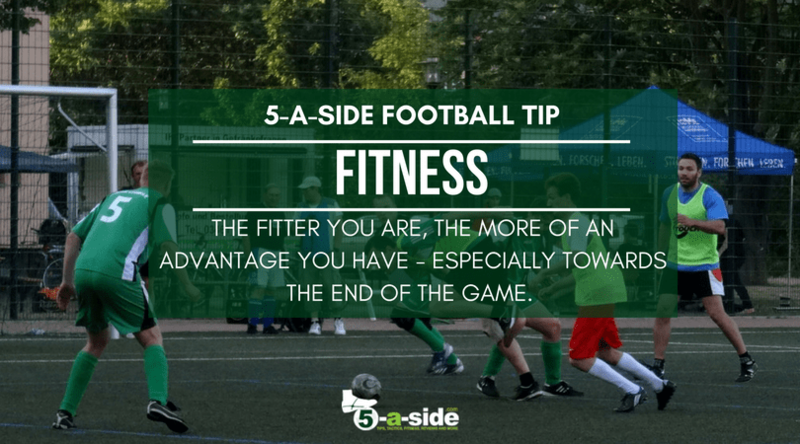 There are many reasons for playing 5-a-side football: for the fitness, the social aspect, or simply for the love of the game. But whatever the underlying reason, everyone still wants to win. Even playing a ‘friendly’ with your mates, nobody want to lose. There are feel-good benefits that come with getting the win, not to mention the bragging rights. 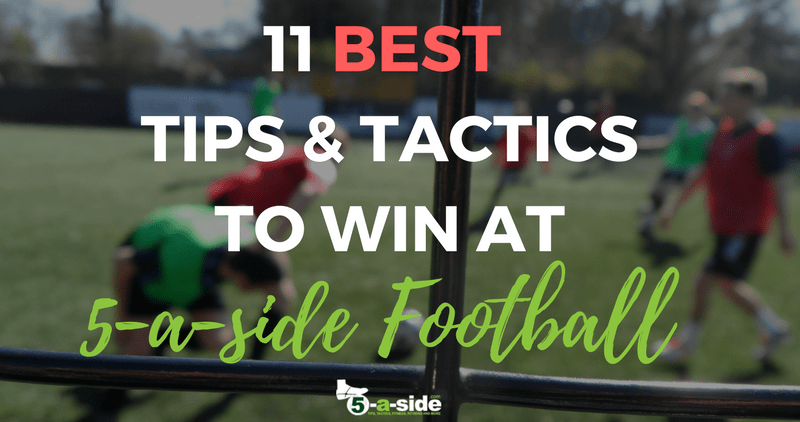 In this article we’re going to explore the crucial tips, tactics and strategies that will help you win at 5-a-side football. 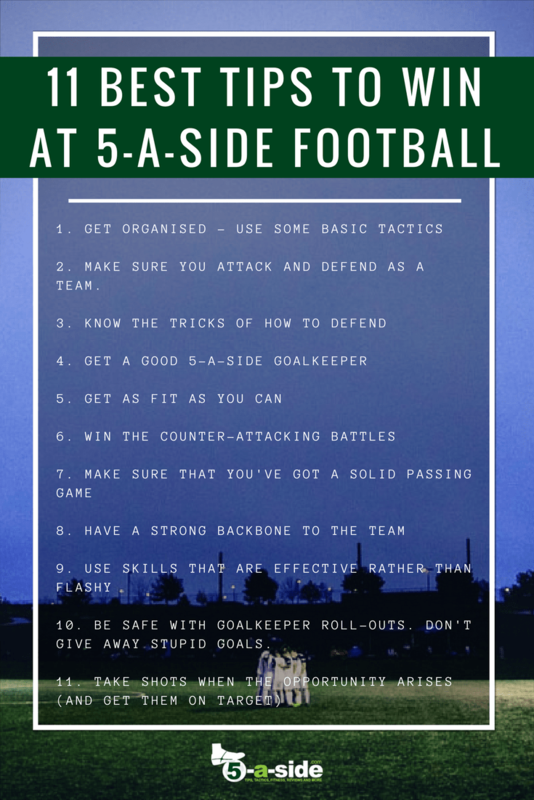 NOTE: this article is an in-depth look at the tips you need to win at 5-a-side. Some of the strategies will take a while to implement. If you’re in a rush and you want the quick fix, check out our 21 Quick 5-a-side Tips for Instant Success.You can always come back to this article when you’ve got more time. Want to win at 5-a-side football? Then start treating it as a specialist game. Before we get stuck into the list, there’s something you need to know. It’s a common pitfall that a lot of people fall into when they’re playing 5-a-side. We’re talking about the huge number of people who approach the game as if it’s just a mini version of 11-a-side. Take it from those of us who have learned it the hard way: this is a sure route to frustration. 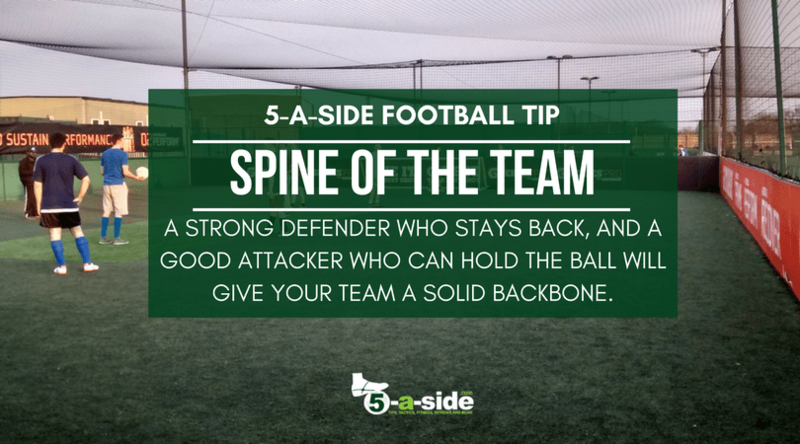 To really get the hang of 5-a-side, you need to become a specialist and appreciate the specific things that will make you successful in this type of football. 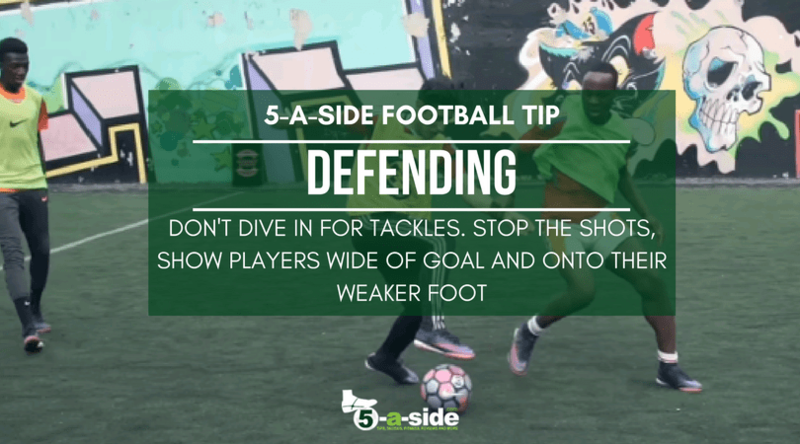 Whilst the skill-set is broadly similar to 11-a-side, there are some specific tips and tactics that work extremely well for the 5-a-side game. These are the things that the experienced teams know, and that give them the best chance of success. So let’s get stuck into them. Lots of teams think that 5-a-side is too informal a game to think about tactics. These teams generally lose. 5-a-side success is so much about organisation. If your team is simply turning up to a game and casually kicking-off without even a mention of where people are going to play, you’ll really struggle. Inevitably, you’ll end up with four attackers and nobody bothering to defend. Instead, just spending a little bit of time thinking about how you’re going to play will go a long way. It needn’t be over-planned, but having a basic 5-a-side formation will really get your players organised. A formation shouldn’t be too rigid, but it’s an important aspect of making sure that you have balance between defense and attack, and over each side of the pitch. 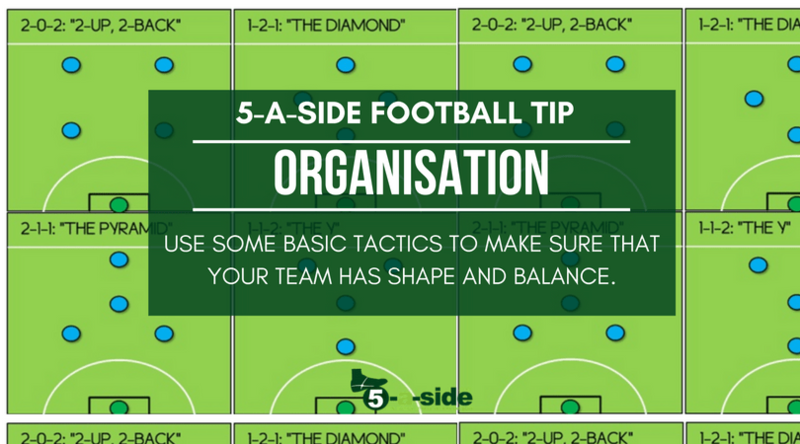 Check out our guide to 5-a-side football formations which will show you the most popular tactics for 5-a-side and help you decide which is best for your team. 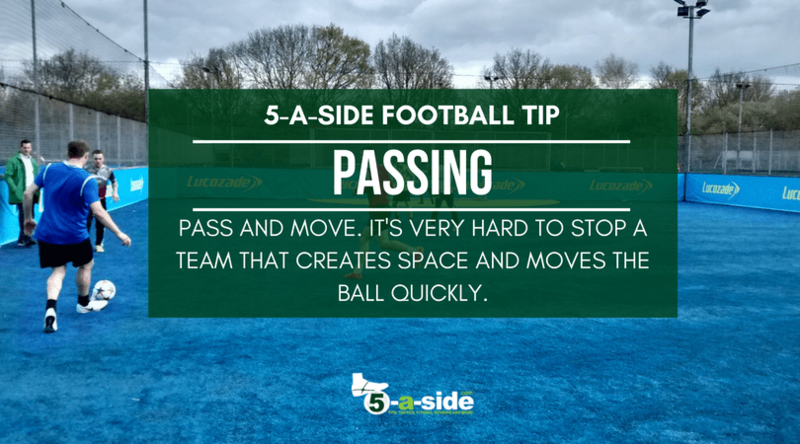 When planning your tactics, it can help to think about what each of the various 5-a-side football positions involves so you can make sure that each of your players can best play to their strengths. You cannot afford to think about the team separately in terms of attacking and defending – you should be one cohesive unit. An attacking player in 5-a-side will be repeatedly expected to get back and defend when his team don’t have possession. Equally, a 5-a-side defender is likely to need to be able to contribute to the play when their team has the ball. In that sense, you need to think about 5-a-side football being like a game of basketball where the best teams attack and defend as a group. Players need to be versatile enough to do both. Teams that are able to quickly get back in position when they’ve lost the ball are incredibly difficult to play against. If your team can defend as a unit, you’ll be on your way to being very competitive. Players not getting back is one of the basic problems in defending – check out the link to read more about why this is such a problem and what you can try to do about it. Speaking of 5-a-side defending, do you and your team really know how to do it properly? Sure, it’s about getting back as a team, and communicating so that everybody picks up a player, but there are some techniques that you can use as an individual which will really help your game. Always make sure that you are goal-side of the player you’re marking, making sure you follow their runs. Force players on to their weaker foot. How many players do you know that play at an amateur level who are truly two-footed? DO NOT dive in to make tackles – that’s when people get past you. Instead, play the patient game, prevent the shots, and jockey your opponent away from goal down the sides where they can’t do much damage. Become a 5-a-side defending stalwart with our ultimate 5-a-side defending guide. It might be just one player out of 5, but some players swear that a goalkeeper represents around half of the success of your entire team. A good goalkeeper is invaluable, always giving you a chance. The art of 5-a-side goalkeeping is a specialist subject in its own right. A good 11-a-side keeper doesn’t necessarily make a perfect 5-a-side one (and vice versa). The two require slightly different skill sets. The job of a 5-a-side keeper is much more about blocking than performing full-length diving saves. If you can get off your line quickly when the attacker is near your box, you can manage to block a lot of the shots. Did you know: in an 11-a-side game, a keeper might get only 13 shots to face in a game, with only a third of those on target (at least those are the stats from the Premier league, courtesy of http://www.footstats.co.uk/). However, given how small the 5-a-side pitch is and that players can almost literally shoot from anywhere, a keeper could easily get over 5 times that number of shots at his goal in just 40 minutes. No wonder it makes them that much more vital to the success of your team! Make it your priority to find a good goalkeeper. 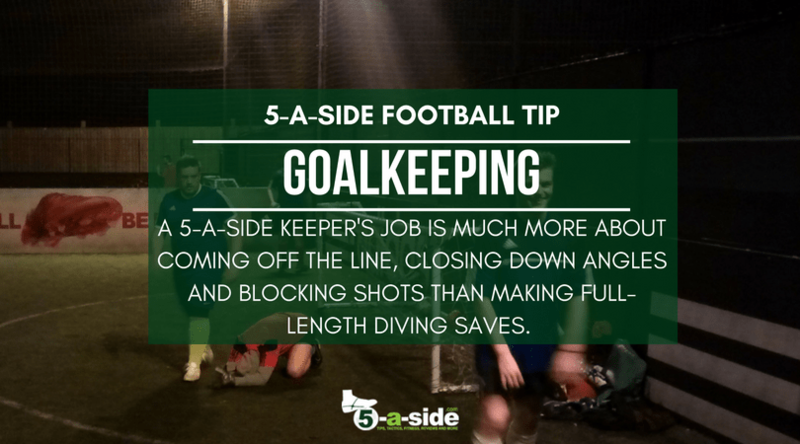 Get your keeper to read our 5-a-side goalkeeping guide, to ensure they know all the tricks and set them on their way to becoming a legend between the sticks! 5. Get as fit as you can! 5-a-side is a quick, intense game. Studies have shown that a 60-minute game of 5-a-side can give players over 4 times the number of touches on the ball than they would get in a full 90-minute version of 11-a-side football. Players also spend a higher proportion of their time performing at a high intensity as it requires almost constant movement, lots of short sprints and a frequent changes of direction. It’s this action-packed nature of 5-a-side that attracts so many people to it (see: why 5-a-side is better than 11-a-side) but it’s also what leaves many a newcomer bewildered and out of breath after just a few minutes. If you’re not fit, 5-a-side will quickly find you out, and the opposition will run all over you. You’ll never be a good 5-a-side player without being fit to play the game. Work out how fit you need to be here: how fit do I need to be for 5-a-side? We reckon it takes a consecutive run of around 6 games to get up to near full match fitness, but if you’re struggling, you’ll need these extra tips on getting fit for 5-a-side. In any sport, the counter attack remains one of the most effective strategies to hurt the opponent. 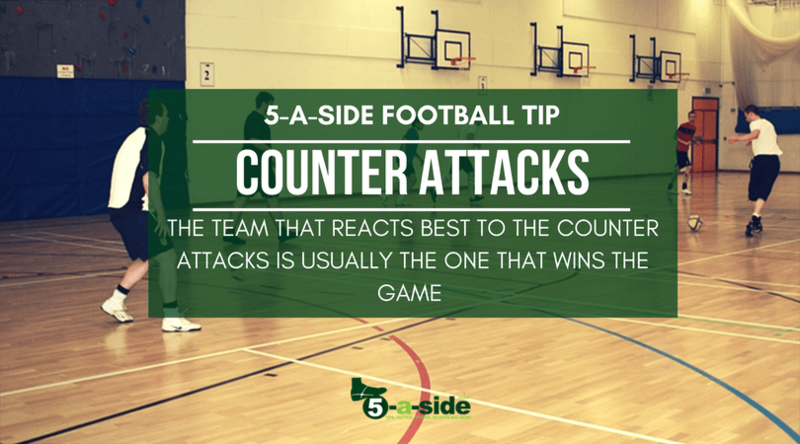 Whether it’s boxing, basketball, or 5-a-side football, the ability to attack quickly and decisively when the opponent is off guard is incredibly effective. In 5-a-side, the team that wins the counters, often wins the game. Being able to go from defense to quickly mount an attack is a great asset for your team to have. Of course, having fast players makes this easier, but it is possible even without that if the timing and quality of pass is good, and players are making the right decisions, particularly when 2-on-1. When you’re defending, it’s really important that one player stays back to stop any fast breaks for the opposition. Using a half-court press and then counter attacking is a key strategy in our guide to how to play against a better team. Make sure you don’t fall victim to too many fast breaks yourself. Check out how to defend 2 vs 1. A 5-a-side court is a small, tight space where skill and precision are rewarded. The court is so tight that no player should have any trouble playing a pass that travels the length of the pitch, but playing long sweeping passes generally isn’t something you get chance to do in a game. Punting the ball long just isn’t effective. In 5-a-side, the vast majority of passes are less than 10 metres and it’s rare to find yourself making a pass over 20m. Given that a lot of people play with a no-over-head-height rule as well, passes in the air are often not on the menu. Being able to play a pass with the right weight and accuracy so that players can control it easily and it’s not intercepted. Look before you pass – make sure that the player is able to receive the ball without it being intercepted. As to the quality of the pass, make sure that you’re able to pass smoothly along the floor – a bobbling ball doesn’t help the receiving player. Getting the timing of your passes right. This is a key skill. Good teams tend to play the quick passing game, with few individual touches on the ball. Hold on to the ball too long and you miss passing opportunities and give the opposition time to reorganize. In addition, a good passing game will only work if players are moving into space. If there’s no movement, the opposition will simply cut off your passing options. Instead, stay on the move, looking for pockets of space and feinting/checking your runs in order to lose your marker. And when you’ve played a good pass, don’t just stand there admiring it – move! Develop the ability to pass the ball accurately flat along the floor. You should be able to do this with either foot. 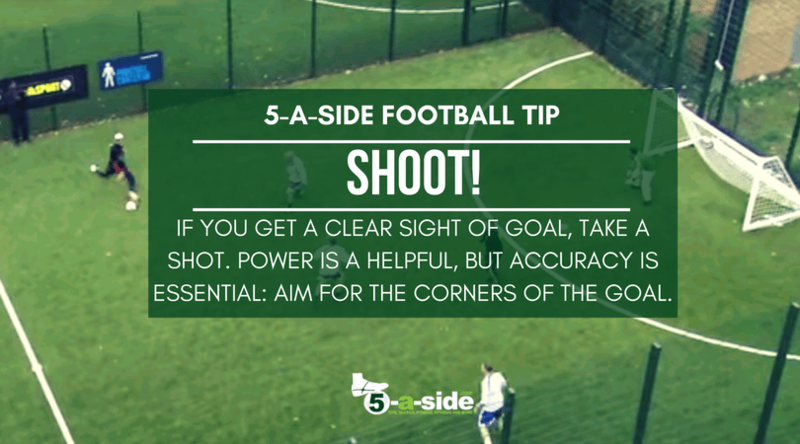 This is one of the key skills for 5-a-side and infinitely more useful than any flashy flicks or tricks you can develop (see our ‘truth about skills for 5-a-side’ for more details). Therefore, it’s crucial that you utilise your players in the positions that get the most out of them. One of the keys to winning games is having a good spine to your team. We’ve already talked about the goalkeeper, but the two key outfield positions you should be most worried about are a key defender (or ‘last man’) and a key striker (or ‘pivot’). If you’re struggling defensively, finding a player who can play the ‘last man’ really well can really shore up your defensive problems. Here’s our guide to playing last man: a vital defensive strategy for 5-a-side. Find or develop a player who can play as pivot. A good pivot player can make a huge difference not only through the goals that he scores himself, but also by bringing other players into the attack. Read our guide to pivots here. The total playing area of a 5-a-side pitch is over 5 times smaller than an 11-a-side one. And yet the number of players is only about half. That clearly means one thing: there is a lot less space to operate in when you’re playing 5-a-side football. Long dribbles into the corner are a waste of time. Given the lack of space, you’ll usually find that opposition players are so close that poor touches will be more easily pounced on and punished. The player who likes to play a kick-and-run game quickly gets found out by the tight spaces in 5-a-side. Having a quality first touch is paramount, and you’ll see players who have great control of the ball really stand out in your game. The better 5-a-side players also tend to make a lot of use of the sole of their foot when playing. It offers you the option to control the ball in almost any direction at almost any time. It can be used for trapping, receiving, dribbling, rolling and passing the ball. If you’re struggling to envisage this, you can see a video of it in this article: creating chances for 5-a-side. Focus on improving your first touch. Exercises that are great for improving this are ball-juggling (or ‘keepy-uppy’) and passing against a wall and controlling the ball in various directions with either foot. 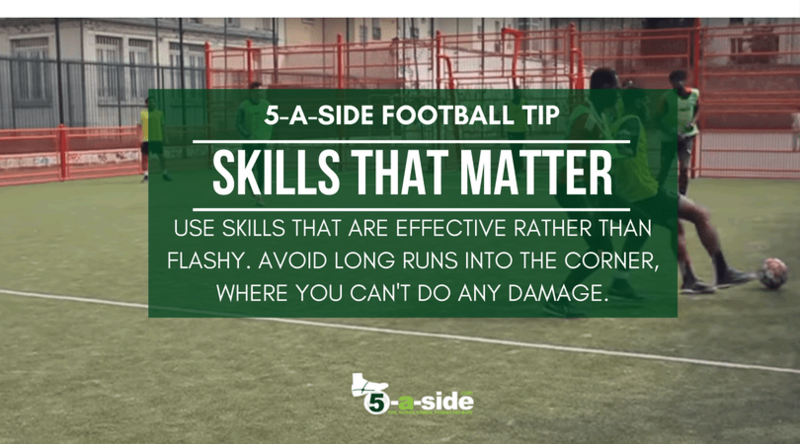 Make sure that you fully understand why sole skills are so important for 5-a-side. You can rapidly develop your sole skills using a simple workout. It can’t be overemphasized how important goalkeeper distribution is in 5-a-side football. When the ball is with the goalkeeper, it’s a chance to regroup and reset. When the ball is with the goalkeeper, take the chance to reset the team and regain some shape (this doesn’t mean switching off and having a rest, though). Keepers – never give the ball to somebody where it will play them or you into trouble. Take your time until you’re sure about the opportunity. Players – don’t constantly call for the ball when you’re in a bad position to receive it. Concentrate on taking up a better position and creating clear channels for the keeper to pass through. When you roll the ball out, use a smooth underarm action, releasing the ball when it’s near the floor so it rolls smoothly along the surface. That way, your players can control it quickly without having to deal with awkward bounces. Just chucking the ball from waist height will cause all sorts of problems for the receiver. 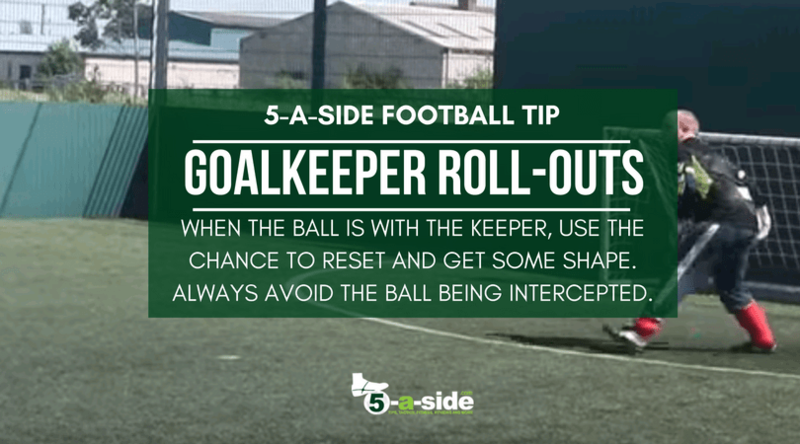 All of the above, and more besides, is covered in the 5-a-side goalkeeping guide. Due to the small size of the pitch, you’ve always got the goal within your sights. So it’s always worth having a go if you’re within range and have a clear sight. When it comes to shooting, having power is a plus, but accuracy is a must. Most 5-a-side goals are low but wide, and shots into the corner of the net stand a very good chance of resulting in a goal. Equally, it’s very frustrating to see a player repeatedly hitting shots over the bar or wide of the goal. The nice thing about 5-a-side is that you don’t have to be too careful in front of goal. Even if you miss, you’ll always get another chance soon so don’t try to overplay it – if you get half a yard of space and you’re central and balanced then let fly for the corner of the net. Practice placing your shots firmly into the corners. You should be able to do this under pressure, on the move, using either foot. The other crucially important point is to keep your shots low (unless you’re playing in futsal-sized goals) as far too many shots fly over the bar in 5-a-side, often as a result of a player trying to put too much power into a shot. If you’re hitting the ball with your laces, make sure that you follow through with your swing as this will help keep the ball low. Don’t be afraid of the toe punt. If you can use this reasonably accurately it can be a really useful weapon. The keeper is usually not ready for this type of shot as it just comes straight off the toe with hardly any backlift. As we said at the very start, success in 5-a-side football is all about doing the simple things well. If you want to win, you’ve got to use all your experience to come out on top. 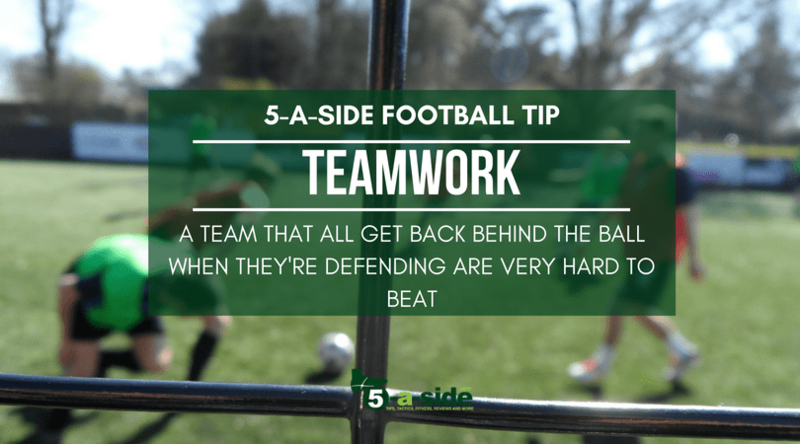 The above 5-a-side tips and tactics should get you a long way towards improving your game. But what else do you find works for you? Leave your comments below. Excellent guide. I think you’ve covered all the essential things. Our team do a lot of this stuff and it does make a difference. I can still see a lot of things we can do better as well though. Thanks. Thanks Adam, good to hear that it gets the seal of approval from a man of you’re experience. Winning at 5-a-side is so very easy to explain, and really quite difficult to do!